Geocaching is an adventure game for GPS users. Hunting for geocache's is a way to take advantage of the great features and capability's of a GPS unit. The basic idea is to have users set up caches all over the world and share the locations of these caches on the internet. GPS users can then use the location coordinates to find the caches. 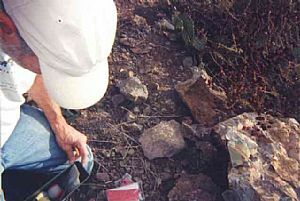 Once found, a cache may provide the visitor with a wide variety of rewards. All the visitor is asked to do is if they take something they should try to leave something for the cache. Join up to login! It's free!